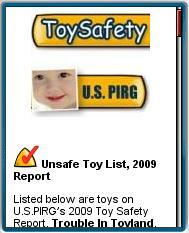 As the holiday shopping rush kicks off in earnest this week, the U.S. Public Interest Research Group, an independent non-profit consumer activist organization, has launched a mobile web site, ToySafety.mobi. It offers tips on how to identify unsafe toys plus a list of 16 toys that are unsafe due to choking hazards, excessively loud noises or toxic materials. Shoppers do need to be careful when buying toys as the hazards presented by some of these products are very real with the potential to seriously harm and even kill children. I think that it is great that the US PIRG has made this information available in a mobile friendly format allowing toy buyers to check products they are considering while they are shopping. This entry was posted in Shopping by Dennis Bournique. Bookmark the permalink.